Like other recent Apple ads, like the "How to Shoot on iPhone" series, today's iPad spots are basically promotional content disguised as explainer videos. A first commercial takes a closer look at file management on iOS 11. Specifically, Apple throws a spotlight on iPad's dock, which with iOS 11 can be used to quickly access recently opened documents and drag and drop files. The features are designed to help iPad feel and function more like a Mac. The second ad focuses on Files, the new dedicated app that lets users search and browse, organize and manage iOS documents. As noted in the short spot, users can browse through files and folders, create folders, drag and drop files, add favorites and search for documents on select cloud services. Files acts as a repository and central hub for local and offsite files, one of the most highly requested iOS feature additions since the operating system debuted. Next, Apple highlights Apple Pencil integration. In iOS 11, Apple Pencil owners with iPad Pro hardware will be able to quickly enter Notes with a quick tap on an iPad's lock screen, mark up Mail attachments without transporting the document to another app, and more. The markup ad also notes iOS 11's new screenshot management system, which lets users open, mark up and share images in a few easy steps. Apple's iPad is, of course, still useful without Apple Pencil, as seen in a commercial illustrating how to perform drag-and-drop operations in slide over mode. The ad also mentions gesture support like the five-finger pinch, which returns users to the home screen. Moving on to productivity features, Apple goes through the process of scanning, signing and sending a physical document. A new AR-powered document scanner tool in Notes provides users a quick and easy method of scanning in — or more accurately taking a picture of — paper documents. The app automatically corrects for size, color and orientation. Apple Pencil owners can then open the document and sign it using iOS 11's markup functionality, then send it off with share sheets. Finally, Apple details iOS 11's enhanced multitasking features. The next-generation operating system allows users to drag and drop apps from the dock directly onto open apps, leaving both windows running simultaneously. From there, text, images and other data can be dragged between apps. Other new multitasking functions not mentioned in the ad include slide over and picture-in-picture video viewing. Technically, iOS 11 can display four app instances at once. Apple is expected to release iOS 11 alongside new iPhone hardware this fall. 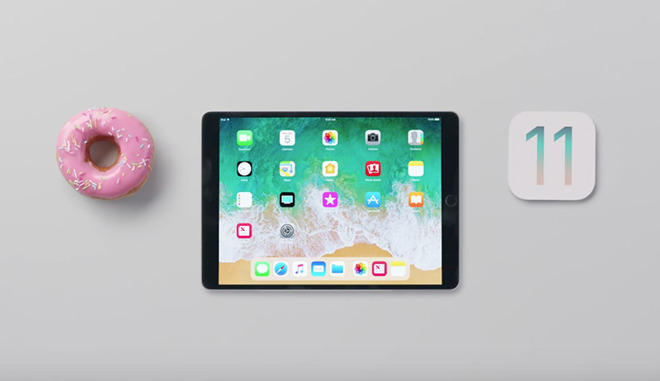 Aside from a visual refresh and platform-wide feature additions like peer-to-peer Apple Pay transactions, the new OS incorporates major changes for Apple's tablet lineup. For more, see AppleInsider's "Inside iOS 11" series.